Having qualified for a sport where pilots endure up to ten G-forces as they reach top speeds of up to 370 km/h while flying a single-seater plane at very low altitude, former Royal Malaysian Air Force pilot Halim Othman maintains an air of quiet confidence as he reflects on his upcoming debut in the world’s fastest motorsport series. Round 3 of the Red Bull Air Race World Championship will be held in Putrajaya from 17-18 May and with the ‘Restricted Super License’ he obtained at the Red Bull Air Race Qualification Camp in Slovenia this year, Halim will compete in the Challenger Cup competition on the first day of the event (Saturday). Halim’s inspiring journey began three years ago and he remembers juggling his day job as Executive Team Leader of KRISAKTI, Malaysia’s first full-time national air display team, as well as undergoing stringent training for the Red Bull Air Race. “I had two major hurdles to overcome. Qualifying was the biggest hurdle because I had to pass the same tests as the world’s most exceptional pilots. The second challenge was to learn to fly safely in accordance with the stipulated rules of the competition, while also flying as fast as I can,” said the top Malaysian aviator. Halim revealed that he has been receiving special coaching from American Mike Mangold, a former Red Bull Air Race World Champion in 2005 and 2007, and underwent rigorous training with him six months ago both in Malaysia as well as in the US. “This sport is all down to skill and precision. With strict new safety rules in place, all competition planes are provided by Red Bull Air Race and are tuned in accordance to regulations. Speaking of his competition, Halim noted that two pilots seem to be in very good form this year judging from their performances in Abu Dhabi and in Rovinj, and Francois Le Vot of France, who currently leads the Challenger Cup rankings with 10 points, is set to be the pilot to beat at Putrajaya. As this will be his first time competing, Halim admits he will place his primary focus during his debut on racing the plane safely through the course. “However, I won’t deny that I also want to get a good result. If there is strong crowd support, I think I will be very motivated to go for it,” said the passionate Halim. With his Restricted Super License, Halim will participate in three Challenger Cup races this year – Round 3 in Putrajaya, Round 5 at the Ascot Racecourse, UK (Aug 16-17) and Round 6 at the Texas Motor Speedway, US (Sept 6-7). Asked about whether he aims to one day compete in the Master Class of the world championship, Halim explains that there are only a few differences between the Master and Challenger Classes and so it is a real possibility. “The tracks are similar but are made easier than the Master Class racetrack and the planes are almost the same The purpose of the Challenger Class is to give upcoming pilots enough experience so they have the opportunity to step up to the Master Class with an Unrestricted Superlicense. With enough training, my goal is to be a part of the Master Class” he said. 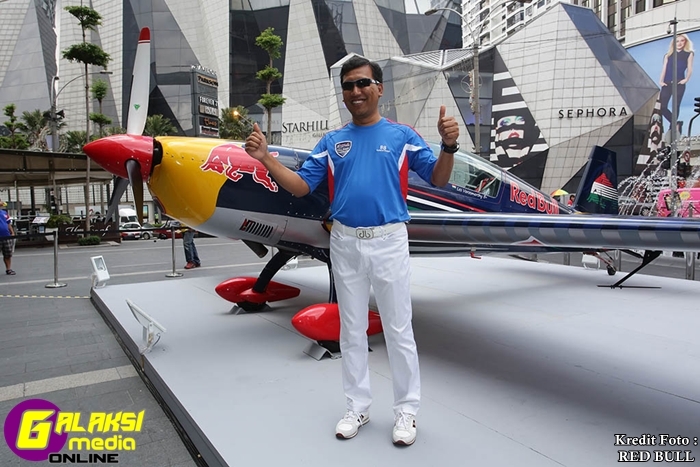 Similar to motorsport racing, Red Bull Air Race pilots race together with a team and Halim is proud to be represented by an all-Malaysian team and hopes to inspire them to the highest level. “While we will focus on the Challenger Class in the first year, we will also prepare for the future as one day I would like to race as Team Malaysia. That will enable us to show the world our ability to compete at this level,” said the Malaysian pilot. In his role at KRISAKTI, Halim will have access to the best and most passionate young Malaysian pilots, and hopes to nurture those who show promise, although he concedes that qualifying the Red Bull Air Race requires a special amount of skill and experience. “The Red Bull Air Race is special and you need to have a very high level of skill to participate. I have experienced what you need to go through and I can assure you it is very difficult,” he confessed. For young Malaysian pilots who aspire to his level, Halim said they would require three things. “They must have commitment, they must undergo the training, especially with an emphasis on safety, and they must get support from sponsors. said Halim. Halim will be racing in the Challenger Class on Saturday 17 May (only Master Class Qualifying will be held on Saturday with the full race on Sunday) and Malaysians certainly should not miss catching this plucky Malaysian pilot in action as he makes his debut in one of the world’s most exhilarating racing competitions. Tickets to the Red Bull Air Race Putrajaya can be purchased online via Ticket Pro’s website.